It’s been busy here in Powburn, but there has been time for holidays too. 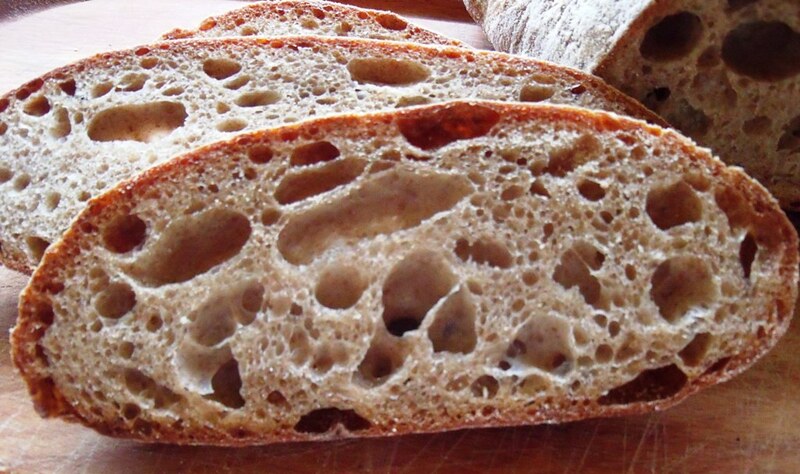 Bakery projects remain live, with much continued interest in the portfolio of artisan breads. It is just a matter of continuing to believe, and to drive it all forward as best as I can possibly manage. After Franko’s visit in June there were the following baking events. 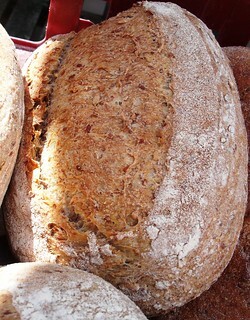 In the last week of June I baked for the Alnwick Farmers’ Market. 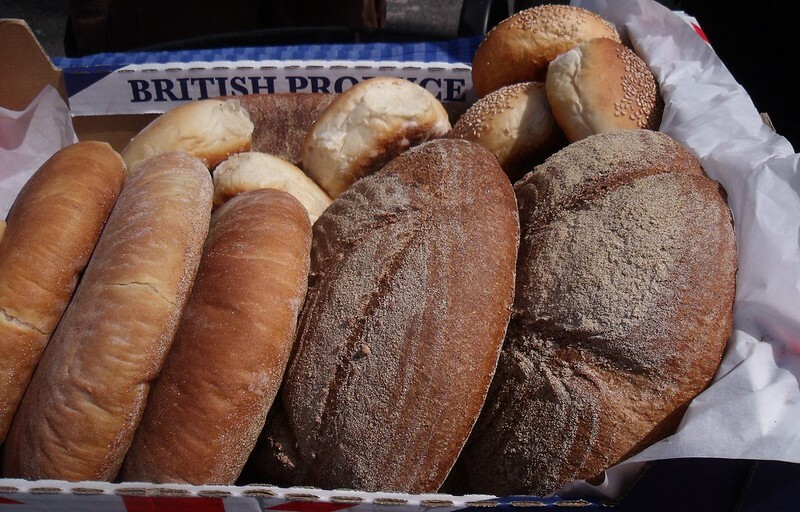 Moving into early July, I had a reasonably small bread order to fill for Nigel who was up in the region doing a catering job for a group of walkers on St. Cuthbert’s Way. After a few days of business meetings, and hard work to complete the year-end accounts and bring all the bookwork up-to-date, I then had a hectic week of baking prior to going away for a week’s holiday. Overall, this project has already proved to be a major success and I anticipate it saving a lot of money in fuel costs as the oven has already proved it will now hold a lot more heat than before. I am working on the business with a very old friend who I actually shared a house with back in the late 1980s when still a student, and then setting up the Red Herring business. He lives very close by now, and has numerous areas of business expertise to share, as well as belief in the products made by Bread and Roses. We had an appointment at Cragside House on the Friday to discuss taking a stall to sell bread during a Cheese Week which is being promoted there later in September. My favourite artisan cheese from the North of England is made by Doddingtons, just a few miles north of where we live. Unpasteurised Organic milk, produced on the family dairy farm, is used to make a range of the most amazing cheese. I am so looking forward to being at this event alongside such a producer whom I actually have real respect for. There aren’t too many of these, alas. Well, after that it was holiday time. Alison’s sister, Mandy, plus her husband Andy, and their boy Lewis, are over from New Zealand at the moment on holiday. 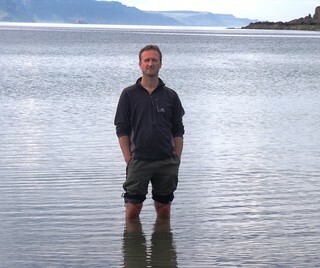 Long in the planning, 9 of us rented the Old Free Church Manse on the island of Raasay for a week; a short ferry trip over from the most fabulous Isle of Skye. Alison’s son Daniel, plus her other sister Beverley, her partner Malcolm, and their daughter Eve, made up the remaining numbers in the group. 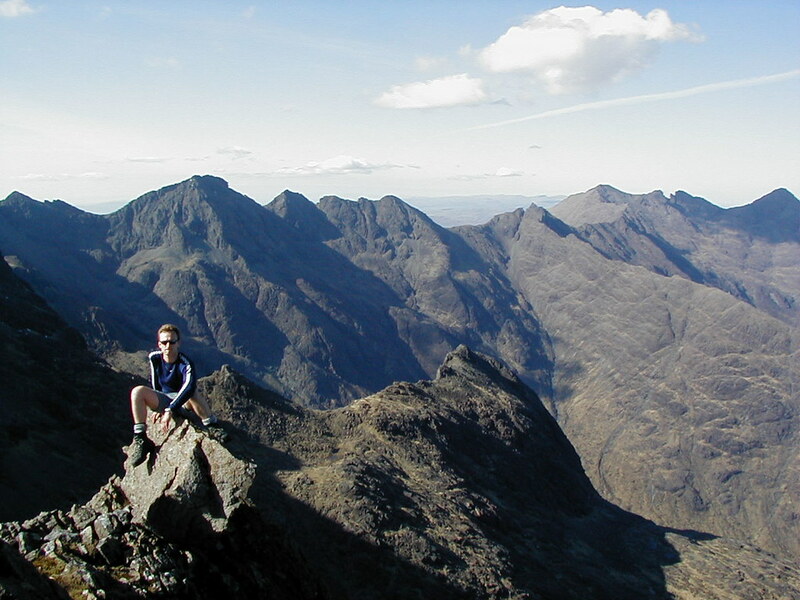 The weather was fantastic, as it usually seems to be when Alison and I trundle up to the Highlands of Scotland. It was a bit humid on occasions, so the midges were in evidence, but it was sunny, and we all had a great week, with plenty of activities, and enjoying sharing lovely food mainly prepared on a huge Aga cooker. Yes, I did bake bread; some lovely and large Gilchesters’ Miches. Saturday 3rd August was the annual Powburn Show. This is my 3rd appearance at the Show. I spent some time deciding how to produce for this year’s event. I settled on using Nigel’s oven which he kindly offered me use of. However, Nigel was away on holiday, and his house is close to 80km away from Powburn, so the logistics were tricky. I went down to Nigel’s on the Wednesday afternoon and fired up his oven. I stayed over both Wednesday and Thursday nights. This gave me 2 days of solid production, and I was assisted by an ex-student and sometime baking colleague on both days. Thank you to http://www.thefreshloaf.com/user/sandydog for your very hard work; very much appreciated. We made lots of rye breads on the first day: Moscow Rye; Black Pumpernickel and Borodinsky are all established Bread and Roses’ favourites, and are all 100% rye loaves. I added in a couple of alternatives using Hamelman’s Three-Stage Detmolder process to produce a 90% Rye and a 70% Rye. I want to read, lounge in the sun and chill out; nothing more. Maybe a meal out in the evening some time, and relaxing with a drink as the sun goes down. Just some fine quality time with my wife! When I get back, I have to bake for the Whittingham Show on 18th August. This will be a smaller version of the Powburn Show, and is 2 villages away, just a few km. The next Hexham Farmers’ Market is on the following Saturday, and Alnwick Farmers’ Market is the Friday after that. September is already shaping up to be very busy. I have an enriched bread course on Saturday 8th September. The following Saturday, Nigel is trading at Hexham and I am at Ingram Show [again a village just a few km from Powburn]. This means double production at Nigel’s house on Friday 13th September. After that there is Alnwick Food Festival. I will be giving a demonstration again, working alongside my colleague Ann, from http://www.doughworks.co.uk/. That means 3 days of trading in addition to the demonstration. Cragside Cheese Week falls in the week after Alnwick Food Festival, and Hexham Farmers’ Market completes the month of baking. We have applied for a spot at Newcastle Farmers’ Market again. If we are successful then these begin early October, and take place monthly thereafter! So, it’s all go here. More than ever, I need a bakery! Vision board and business activity focus on this as priority Uno. Take care all; happy baking! Thanks for sharing, Andy. Beautiful breads, oven, and countryside. Great to hear from you Floyd. I am more than happy to share. And you are wise to fit in holiday time when you can. The Isle of Skye is everything you say, and more. Lovely breads, every one. Best wishes for the next stage of your business. Yes, it's best to be busy, but holiday time to balance out all the activity is essential, of course. 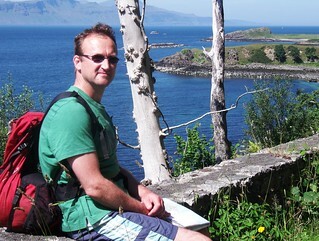 I cannot do the Isle of Skye justice in a couple of sentences in this blog post. For those who truly love mountains, maybe this will help add further appreciation? From 11 years ago, and it is still the photo I use for my Desktop on my pc!. Your good wishes are very much appreciated; thank you. made me feel fantastic - to be retired! What a busy schedule. Whew! I here Skye is a great place to find some fine scotch at reasonable prices too :-) The sunsets must have been lovely with a smoky drink in hand. Must have reminded you of WFO baking ? I've never made your Prune and Brazil Nut bread except as a SD so I don't know that the yeasted version was like but am guessing the SD version is better. 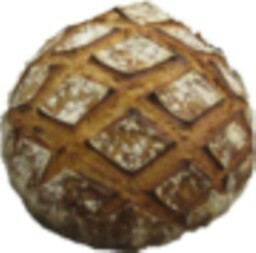 I want to retard a 100^% rye for 12 hours using a small amount of levain and no bulk ferment on the counter. Which one of your breads would you recommend to be best for this process? Glad you could stop to smell the roses with your wife - she deserves it :-) All your bread looks great and the Patio WFO refit loks like a winner too. I fear you may be disappointed by the price of Single Malt Whisky if you are looking for bargains in the native land of production. Skye whiskies go for £40 and more on the island; that's a 750ml bottle! But you would be right to assume they are fantastic quality, for sure. For Brazil Nut and Prune Bread, yes, the naturally leavened version is superior. But it isn't sour in my world. I don't do sour wheat bread. And the biga version is a very close second. I don't do retards for any of my breads. Trying to retard the amount of dough I make in a domestic fridge is a complete waste of time, and it doesn't fit my lifestyle. And retarding 100% Rye bread seems plain wrong to me, although I am sure others may not agree. So I have no recommendations on that, sorry. Many thanks for your kind words; and especially that you notice Alison and I need to enjoy the "roses". That is so true. Another choc a block post full of interest, fantastic photos great stories and a window into a very busy man sharing his interest with like minded souls. Thankyou Andy that's another hour i have spent at the computer! i must say the renovation to the oven has come up an absolute treat, and good that you have already been able to detect the benefit of extra insulation, something that is really important to anyone contemplating building their own WFO. I take it you consider that hour spent at the pc as time well spent? Your kind words are very much appreciated as always. Right now I am totally NOT busy; it's wonderful. I'm on a shady terrace looking out at the beautiful hillside country here in Southern Spain. Soon I'm going to crack open a bottle of local Rioja. Insulation for extra top heat is crucial for any bread baking in the wood-fired oven. And, of course, the roof keeps out any moisture which would only further compromise that top-heat retention. Don't know how you do it mate, your schedule just keeps getting busier all the time. Good that you were able to get away to Scotland with family though, and even better that you and Alison can get away, just the two of you for a little R&R. Beautiful photos in this post, not only of the Scottish countryside, but your own lovely corner of the world In Northumberland. Nice job you and Nigel did on your oven, it's looking pretty spiffy. I'm sure the performance is noticeably improved with the all the work you fellows put into it, not that it was any slouch at performing while I was there, but the added insulation must allow for more retained heat over a longer period of time than previously. Funny, I was looking through the photos in your post first before reading the text, stopping on the one of your baking colleague sandydog, and thought hmm, that looks very familiar, when it dawned on me I'd stood in the exact same place on Nigel's terrace just a few weeks ago back in June. Your breads, as always are of the finest kind Andy. Now that I've had the opportunity to see with my own eyes your commitment to excellence that you put into each and every loaf, from the high quality organic flours you use, to the traditional craft methods you employ, it only makes sense that you are keeping busy, and will get busier still, no doubt whatsoever in my mind. Have a wonderful and relaxing holiday in Spain Andy, and here's to more sunny days ahead. Yes indeed, travelling down to Nigel's to bake is not easy to timetable. Fortunately when you were here to stay, Alison was on half term holiday, and now she has broken up for summer holiday too. So at least I have the car and don't rely on her to take me to Nigel's early doors before she starts work; that is an absolute killer for her. I believe I've come up with a solution for that moving forward, so I will have access to my business partner's vehicle for Hexham production. But I am going to be reliant on my own wood-fired oven for most of the upcoming baking, so getting this work in with Nigel to improve it was essential. In fairness when the weather gets hot like it was during your visit, and I am able to fire the oven properly, it functioned pretty well. It has to be noted, however, that we didn't really try to bake a lot of loaves on that oven together. I am really aiming to get 40 loaves per day's bake on it! Now the refurbishment is done, I believe that should be manageable without all the stressful time constraints I have come to find myself under previously. Great post and photos of it all Andy. I can't imagine how you keep up with all the different kinds of breads you offer. You were the one to inspire me to bake more than one type of bread in a day. To date my max has been baking 2 different types in a day but I only do that occasionally. Just too much juggling for space and time. In another lifetime perhaps. Good thing that you can manage holidays with such an intense baking schedule and that they coincide with your wife's work schedule too…. Thanks for another peek into your busy baking life. A quick edit of sorts. I just did a search and found where you have listed the Moscow Rye formula (2/12). Appears to be very similar to the Borodinsky with the method though different spices added and no wheat. One question. In the top box you list your rye sour build in 2 stages. In the following box under 1a you have the ingredients for the rye sourdough. I see no mention of a seed portion to create the fermenting of the flour and water you have listed. How much did you add from the rye sour that you built in the first box? Thanks for the clarification….Looks like one I would like to give a try to someday just to see how it compares to the Borodinsky that people around here love. Many thanks for all your kind words; they are very much appreciated. 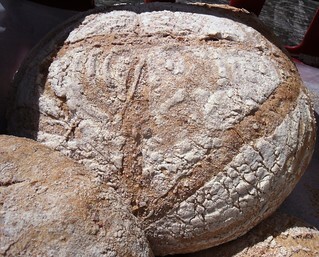 Yes, on day one we made 5 different types of Rye breads, using 2 different fermentation systems [Auerman and Detmolder]. On day two we made 7 doughs which used the wheat levain plus a batch of croissant dough [yeasted, overnight retard], plus a batch of ciabatta dough made yeasted, with a Biga. Not hot by your standards, of course, but an overnight temperature of 24*C was the hottest night of our year so far, and made it hard to control the leaven for sure. So day two production was very much full-on. We made a total of 90 loaves from 14.5kg of leaven that day! Actually I now bake the Borodinsky as a 100% rye bread, although I know the official recipe[ which I adapted to accommodate my liquid starter, and desire to avoid white sugar in the formula] does contain that small element of wheat flour. So for both the Borodinsky and the Moscow Rye, 50% of the flour is pre-fermented, and that is mainly Wholemeal Rye, with a portion of Red Rye Malt. The remaining 50% of the flour which I add to make the final paste along with the salt, is all Light Rye flour. I use Organic flour from Shipton Mill, which is graded as Type 997; in other words, 0.997% ash content. This is the finest grade of rye flour I have found regular access to. 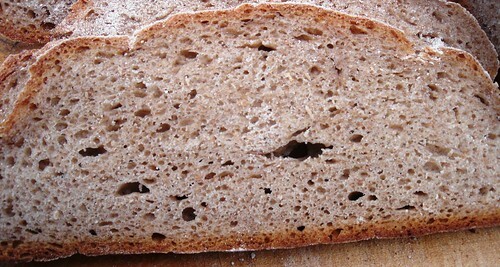 White Rye flour is not common in the UK, and I guess that is the reason why a true Dark Rye flour is equally rare. While Shipton sell a Dark Rye, it is in fact a wholemeal, so not a true Dark Rye at all. Anyway I digress. Yes, you should make the Moscow Rye; it's probably the easiest of the three 100% rye breads I make regularly. It has just a hint of caraway, and quite a bit less molasses than the other 2. To determine how much seed starter I used, you need to refer to the Rye Sourdough refreshment table placed above the formula and recipe. The first figure for the amount of sour is what I actually began the build with from stock. That is usually the 40g I keep in the fridge, but sometimes I may already have more to hand having already baked very recently with the rye sourdough. To give you an idea, I'll be ordering my 5th bag of the Bacheldre Rye flour of this current year very shortly. It comes in 25kg bags, and that only constitutes half of the rye flour I use anyway. So you can see I'm making a lot of these breads, as that is something approaching 250kg of flour used in around 9 months! My rye sourdough is always hydrated at 167%. For my purposes, I tend to think of this is fractions of 1/8. It means 3/8 of the sour is flour, and 5/8 is water. That allows me to list the rye sour as shown in the formula, so it is easy to determine total overall hydration, and the amount of pre-fermented flour in the formula. But you can see the "seed" element in the refreshment table quite clearly. It might help if I explain that the formulae I now publish on TFL are all derived from part of my food safety system, in place in order to comply with the traceability aspect of food safety law in the EU. So, all my different doughs are assigned a batch number at point of production. The table above the formula will show exactly how the leaven or sour was built for that dough, or there will be a cross-reference on it to show which batch of dough to look for to see full detail of the leaven build. To illustrate this: On Day Two here for production at Nigel's, I used wheat leaven to produce Gilchesters' Miches, White Levain, Seeded Sourdough, Five Grain, Dinkel [Spelt] and Toasted Brazil Nut and Prune. In total I needed 14.5kg of leaven to make these doughs, and showed the detail of how this was built on the sheet with the first batch number, and what was comfortably the largest amount [21kg of dough], which was the Gilchesters Miche. All the other doughs had assigned batch numbers and an accompanying dough sheet to file away. At the top of these sheets in the levain build, there was a cross reference to the Gilchesters' Miche dough sheet to ascertain how that leaven was built. The other detail needed is the date and batch code for all the materials used, plus initialed sections to show the full specification in the process has been complied with from start-to-finish. THanks for explaining your process with your formulas. I find that once I understand someones method it becomes a whole lot clearer what is taking place. Interesting that you shoot the HL up so high. Surely you can't 'shape' a dough that wet. I am thinking that it gets 'poured' into the loaf pans? To my mind a rye dough at that level of hydration would be almost a batter consistency and something that would stick to anything it touches if I tried to shape it as I do my wheat loaves of a lesser hydration. I will add it to my line up of rye breads to bake. I am curious as to why you consider it the easiest of your ryes to mix etc. Your process looks exactly like how I do your Borodinsky. Lots of just sitting time with short intermittent mix stages tossed in. Again, thanks for the clarification! Sour is hydrated at 167%, but overall total hydration of the final paste is 85%. Also note that the "Scald" portion involves considerable starch gelatinisation which causes it to stiffen markedly. Scald and Sour are then combined to form Sponge. You are right that there is little difference between process for Moscow Rye and Borodinsky. I probably find the Moscow Rye easiest because I make that one the most often. And it is the one with the most customer demand too. You use wet hands to scale the paste, smooth off the shape and place into bread pans. Why do you think they prefer the Moscow to the Borodinsky? I am thinking the spice since that is really the only significant difference???? but I really do not know since I haven't done a Moscow yet….but in writing about it I find it is now pushing itself up to the front of my to bake list…..curiosity only satiated by my trying it out to see how it differs and I do still have some rye sour left over from the B. sitting in my refig…. Thanks for all of your help Andy. I really appreciate it! Secondly - the amount of caraway is listed as .1%. I am only asking because, as stated before, this formula is pretty much the same as the B. but the B. uses 1% of the coriander rather than just .1% which tells me that the B. is a much more heavily spiced loaf which may account for more people preferring the Moscow???? Just totally wild guesses here as I compare the 2 formulas…..
And finally in regards to the scald: When I add boiling water to flour or coarse grains I generally cook it all a bit like making a porridge of sorts. In this formula you simply pour the boiling water etc. over the dry ingredients - if I were to cook the mixture a bit would that change the outcome due to too much heat for too long? I posted a long reply, but it got lost in the ether! Anyway you have since added more important questions which need answering. In doing so everything should be covered for you. I don't use any yeast; just the sourdough process. It must be included in the original State formula, but I don't use it ever. Yes, I think this is wht the Moscow Rye is the more popular loaf, as it becomes more versatile because the flavour is not so overt. Also, there is less sweetener in the formula too. I hate it when stuff gets lost in the ether especially when it is long. Thanks for clarifying for me. How odd that 'they' make you include yeast in a formula!!!!! I have written up my bake sheet and will begin tomorrow and see what kind of timing I get doing this. It's not the yeast I need to include for authority satisfaction. That's pretty impossible with wild yeast anyway. It's about traceability of the flour used, and ensuring conformance with pre-determined schedule which is deemed as process fit-for-purpose. It may seem a bit of a bind to some, but it makes perfect sense to me. I want to be able to demonstrate that my bread is safe to eat as part of the overall mark of quality I am prepared to shout about in search of sales. Firstly, the scald was a lot thicker than the scald in the B. Is that true with the scalds you make? Made it a tad bit hard to mix into the sour which was very loose. Think I will water down the scald next time and adjust the water in the final dough…..
Also, and I apologize for this question a head of time because I know it has probably been discussed here somewhere but my memory….. There is no difference in the scalds in terms of flour: water ratio. Both use 20% of the total flour in the paste, and that is hydrated at 175% to make the scald. The only differences are in the type and amount of spice used and the amount of molasses. Also the proportion of rye malt as part of that 20% figure is different in the 2 loaves. So both scalds should look the same if you use the same temperature to mix at. I use water on full boil, so the gelatinisation is maximised and the scald becomes very stiff. I'm not saying that is right, or, the only way to go. But it's given me the best result in terms of handling the final paste. I actually immediately mix the scald with the sour these days, to make the sponge. This means the sponge gets warmed up, so the secondary ferment gets a real kickstart. Remember, I use a liquid sour, so combining this with the stiff scald in a mixer, using the paddle beater really isn't a problem. You do need to scrape the bowl down properly a couple of times, of course. Because I use the liquid sour, I don't have any spare water to add to let the scald down. Anyway, I don't think this would be correct procedure. The whole point of the scald is to gelatinise the starch so the paste thickens. If you don't want it so thick, then better to add your water at 80 or 90*C rather than on the boil. 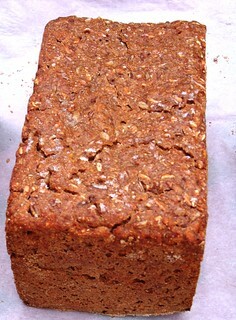 One important factor for the use of the scald is to incorporate the extra water needed for 100% rye bread. My formulae use 85% overall hydration. If you want to let the scald down, will you not be increasing hydration even more? I have tried to work with higher hydration, particularly when dealing with poor quality rye flour, which has been badly milled leading to excess starch damage. Well, it's all very well ending up at 100% + hydration, but I have then come unstuck trying to bake out the loaves, and ending up with gummy mess. Hats off to Mini, to Giovanni and to Andrew Whitley for their success at this hydration, but I can't make it work for sure. Essentially rye paste is held together by the pentosans qwhich knit together the starch molecules. Unlike wheat dough, rye does not utilise gluten proteins for dough structure at all. Only wheat has gluten which forms into long chains. Rye is dependent on how the starches stick together. I suspect the scald assists with this. It also sweetens, and provides amylase to speed up fermentation. Thanks for the detailed information. I did end up doing a search to try to find the discussion I remembered and I did find it somehow. This information sums all I read up in that discussion very concisely. I printed it out so I have it on hand in my rye binder!!! I went back and read through my B. notes and realized that the formula I follow is not your original but a compilation of yours, Phil's and Vardas. The scald was thinner. When I first bake a formula I always 'try' to stick to the original as much as possible. With your reply above I now see where I can wiggle things a bit when I bake this again. I usually do the B. sponge mix by hand….saves washing the mixer so I might fudge around with the HL and see what I come up with. I can thicken up the sour a bit which is what I think I did with the B. Nice to know that you play around with things to in order to fit your schedule. One of the things I love about this site has been learning how to use various methods to work with my breads so they work with MY schedule too :- ) I love the refrig!!! It has saved me many a time. Interesting to know that using the scald right away doesn't change the final loaf. When I first started making mashes I was very careful to follow the temps and times as closely as possible. I know a scald is different and produces a different result but I have read where others have experimented between the 2 methods and they can't tell a significant difference which is really nice to know! Scalds being a lot easier to use. Thanks again Andy for the information you have shared! I get what you say about not dirtying the mixer, but can I play devil's advocate and ask why you have the machine in the first place? Basically working with 100% sticky rye is tricky. So if the mixer makes it easier, surely you should just reach for it, rather than tinkering with the formula merely for your convenience? To me the hydration level of the scald/sponge, and the temperatures used for all stages of this process are pretty fundamental. I personally wouldn't tinker with them at all. I'm not saying "don't". If you find a method that works for you, that's great. You are quite right to make adaptations with schedules where possible to fit your life, and to improve your final bread. I'm just not convinced that saving on the washing up is really part of that. For chilling to retard, try to imagine this. I have 11kg of Gilchester Farmhouse dough which I have somehow successfully managed to retard overnight in bulk in my very small and not powerful domestic refrigerator. For the odd loaf, retarding in the fridge works as a powerful tool for homebakers. But on my scale of production, it is, unfortunately of far more limited use. But your point is well-made. We need to use all tools available to us to help make better bread and manage everything else going on in our busy lives at the same time! Its okay to be the advocate….I am used to cleaning the mixer with ww flours and it is really easy to do. Rye pastes are just a whole lot messier to deal with….. When I do ryes like the B I usually mix them in the morning while still having my daily ww dough in the works to be mixed in the evening. So it is a time issue on my part - creating the time to clean the mixer 2 times in one day on top of all the household tasks I preform since I am a home baker. My time is divided many ways so the extra time is taken from another chore and this baking is purely pleasure for me so I have to balance my pleasure with my 'work'…..If that makes sense. I also like to try to only wash dishes one time a day too….Saves on dish soap and time. When I 'dirty' the DLX in the morning I then have to wash it for the evening mix…. Next time I try this formula I will pull out the mixer and use it and see how it goes. If you soak your bowl and attachment, then the rye paste is easy to clean off. No insoluble proteins to shift! So you'd not be up for using a wood-fired oven then? 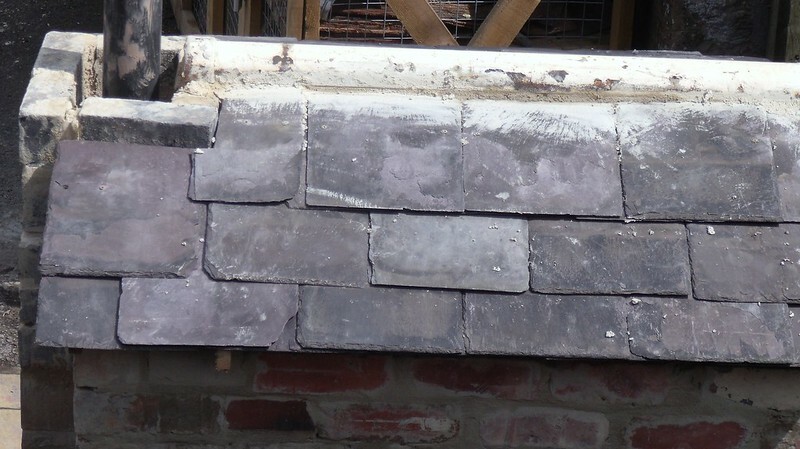 The oven retrofit looks really good and the slate roof is charming; glad to hear it gives better heat retention. The breads - the absolute best!, rye boules beautifully crackled, and the Gilchester's Miche, showing us how it should be done! The Scottish countryside is breathtaking and glad you had a happy time with family; was it fabulous cooking on the Aga? (I've always wanted to fire one of those up and see what it's like to cook with one). Have a fabulous, well-earned holiday in Spain! Yes the bread courses from home have gone very well this year. They are advertised on my website but I don't promote them too heavily as I am very aware that proper production premises is "priority uno", and a commitment to run a lot of courses would quickly become an obstacle were this to take off. But they are fun times and I do offer a lot of learning opportunities for those who come along to bake for the day. I have actually had experience of baking on an Aga over many years as my Mum and Dad have one at home...we moved there in 1978 when I was 13. The Aga was fueled with coke, or furnicite originally but it was converted to gas when that was first piped into the village where my parents live in Yorkshire. My brother fitted an oil-fired Aga in his house a while back too. Wow, that ran so hot! The one in Raasay had 4 ovens, so it was huge. It ran on electricity, so very modern. Aga's work great for one loaf of bread. But you might be surprised how little heat they retain! Your comments are very much appreciated, although being honest, your version of the Gilchesters' Miche looks far more attractive than mine with the lovely stencilling. Thank you so much re: the stencilling. My dear father-in-law from time to time speaks affectionately of the old 'sawdust burner' kept in the basement of his family home, on which his mother cooked her jams and jellies in the hot months of summer. The more modern options of gas and electric do not offer the same degree of solidity of heat as the more traditional fuel. Wood tends to be less solid, as it burns up so quickly. My Mum bakes a great Christmas Cake on the Aga. She sends everybody off for baths, as all Agas will prioritise heating water first before providing really solid oven heat. She then turns the oven right down to minimal, and bakes her cakes the next day! and you don't have your own bakery ??!! What an amazing array of baking and capabilities and you are using borrowed space. I can only imagine what a powerhouse you will be when you have a brick and mortar location all your own. Stunning views from your vacation. I second what Janet says about the variety that you present. I note you say you can't retard the doughs which of course makes sense as you have no facilities. I wonder how you make all the doughs then and where they are placed to rise ? After shaping how many baskets/pans have you ? You must be going 24 hrs straight there at the end as the different loaves become ready for baking. You use natural leaven as well as spike with commercial yeast to get timing ? No I don't have my own bakery yet Caroline! Well, I do bake quite lot of bread at home using my kitchen and the patio wood-fired oven, of course. The oven I used at Nigel's is a real beast..ask Franko! It holds around 40 x 600g hearth loaves at a time when carefully loaded. 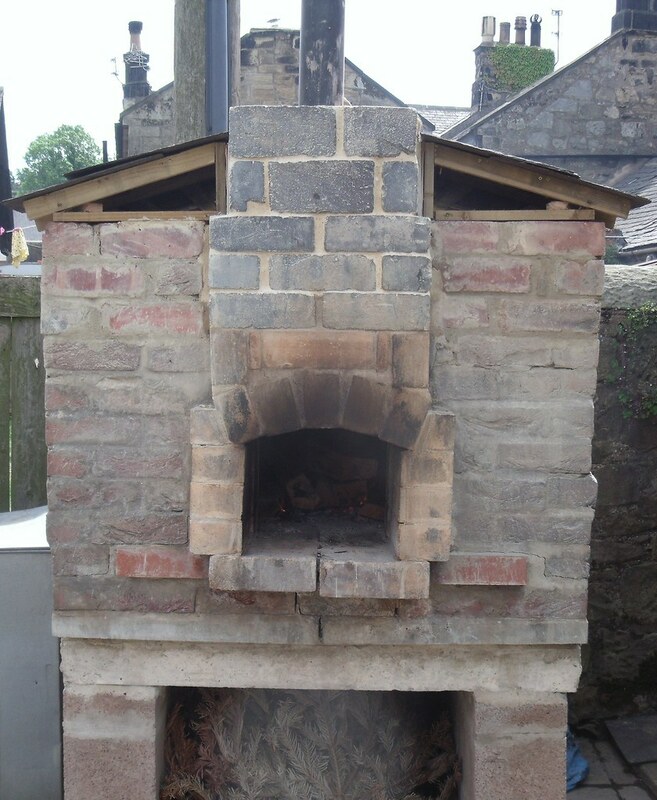 It is also insulated with double layer of firebricks, so once fired it stays hot for ages. Here Brian and I made 25 big rye loaves on day one, then on day two made 90 hearth loaves plus some ciabattas & focaccias, and 3 dozen croissants/pains au chocolat. I'm thinking the oven phase still only took around 4 hours to complete. Dough mixing and processing was more tricky as it was such a warm night. I think I mixed 9 different doughs all off the same leaven. There was around 15kg of 60% hydration white levain to use, and one 20 quart Hobart mixer with 2 bowls for continuous mixing. I have around 40 bannetons of my own and Nigel has plenty too, so we lined everything up to bake as soon as possible given the heat. No, the leaven and sourdough breads do not utilise baker's yeast; just the natural process. 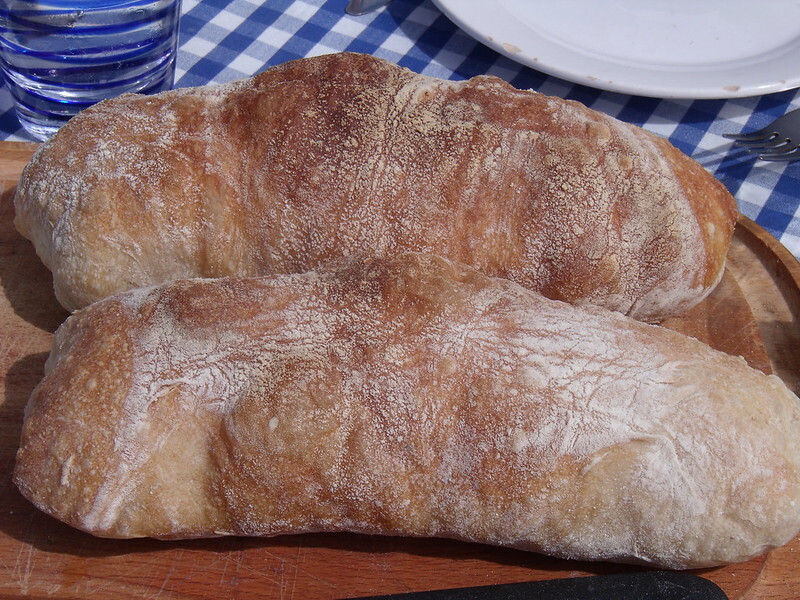 But both laminated dough and ciabatta were yeasted process doughs. Another well-rounded meal of a post. Andy, I don't know which I enjoy more - your personal saga, your breads or your vacation photos. I suppose it's all of a piece, but, to all fit, it must take the skill of loading a WFO to capacity. Many thanks for your comment. Learning more about Nigel's oven was an intrinsic part of this baking session. Interestingly, I am probably happiest loading his oven by myself. Ordinarily, I drop the loaves on the peel, and Nigel sets them in the oven. This is how Brian and I proceeded too. It was a big ask for Brian, but he did it really well. Fortunately, we didn't have to really cram the loaves in, as we had done a number of smaller-sized doughs. Nigel and I bake less of a range for the Hexham Market, but in bigger numbers; so we fill the oven each load. Brian sort of copped for it because I'm left-handed, and, of course Nigel has designed his oven for right-handed loading, and the space around the oven is very tight!! I'm quite used to having to turn everything round in bakeries for things to work for me. But it tends to annoy the more regular operators for sure! I will design my own operation for a south-paw methinks! For sure the premises will happen sooner or later...I guess the time has to be at the right time. Meantime I keep working towards being as organised as possible, and confident in all the products. Good luck with New castle's market, you'll be busier than ever if you got a permit for it. I'm now back in Powburn, planning production for a small show this weekend. Yet to hear back about Newcastle Farmers' Market; you are right, this will make Nigel and I very busy bakers. Excellent to hear from you. I hope you are having a great summer in the South of England too. Looking forward to seeing your vision board come to life. Breads look great and I will be interested in how you find your ovens performance after the 'upgrades'. Hope you had/or are having a warm and sunny holiday! That's moving along nicely in many ways, thanks Phil. Alison is putting in some inspirational ideas in terms of the longer term plans to satisfy the real concept of "Bread and Roses". The shorter term stuff is moving slower than I would like; 'twas ever thus. Always obstacles to overcome, and we continue to work hard to manage all this. But, yes, the oven is performing a good deal better, so making 30 loaves each day is easily manageable, with 40 being quite realistic, as opposed to being improbable and stressful as in the past! Spain was hot and a great time for us to do not very much for a short and restful time.